This delicate style blends the intimacy of a saintly medal with the noble look of a stately crest. 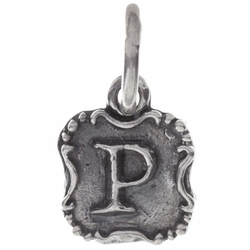 These sterling silver charms are small in size measuring 3/8", but large in meaning. Choose an insignia in all caps serif letters A-Z to honor a loved one or yourself. This charm looks lovely on daintier chains like the Baby Ball Chain or Petite Silver Chain. Combine with other charms to create your own story.